Teaching Spanish in the Digital Age: A Flipped Classroom or Just Hybrid? Many hybrid programs have been created in higher education institutions in the US for the last 15 years, most of them consisting of the combination of classroom instruction and an online platform. However, the flipped classroom has become very popular recently as a result of this hybrid model of instruction. The purpose of this chapter is to respond to the following questions: What is a more recommended model for teaching Spanish in the digital age? What kind of activities should we focus on, as instructors, in the classroom? What works best for students to study and practice outside of the classroom? Both models will be described with their advantages and disadvantages so that instructors can choose the one that better fits their courses. In 2012 there were over five million college students in the U.S. taking at least one hybrid or online course (Russell, 2012). The typical hybrid course consists of face-to-face interaction and the use of an online component. That is, it is a form of classroom instruction that incorporates both face-to-face instruction with web-based multimedia instruction. There are several factors to consider when designing a hybrid course. According to Sitter, Carter, Mahan, Massello, and Carter (2009), there should be a careful balance between both face-to-face and online components, with clear objectives and elements to engage students in deep critical thinking and learning. In order to do so, it is important to make a good selection of the best assignments for the face-to-face classroom and the best to do online. One of the main goals of hybrid instruction can be exposing students to structured input activities based on the theoretical framework of VanPatten’s (1996, 2000) input processing model, essential for second language acquisition. Usually, these activities are done online before coming to class via an electronic platform, in contrast to the traditional classroom. There is a time management system so that instructors can set up deadlines in order to make sure students finish the activities on time and come ready to class. This way, instructors can maximize their face-to-face class time with communicative activities. 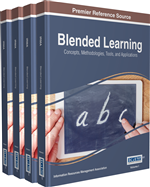 The benefits of using a technology-enhanced teaching approach are supported in this chapter based on the effectiveness of hybrid and flipped models according to classroom-based research, specifically in foreign language instruction in higher education for small or medium size classes. In a nutshell, this new learning environment is a combination of face-to-face interaction with an online component. Research has shown the benefits of using this hybrid model compared to the traditional model of all face-to-face classroom instruction (Caulfield, 2011; Koller, 2011; Ng, 2009; Rubio & Thoms, 2012). According to the research cited here, instructors spend less time lecturing as students spend more time engaged in task-oriented activities in a hybrid course. Thus, students become engaged as producers of their own learning outcomes, they develop more autonomy, and are provided with communicative tools to make the language meaningful in the Spanish classroom (Hermosilla, 2014). It is a model that provides beneficial results since it combines the best of both types of instructional delivery (Presby, 2001). As is widely known, hybrid courses are now very common at the college level. Usually, grammar lessons are taught in the classroom because of their learning complexity, while practice is done online, especially input activities. However, as Hermosilla argued, there are also challenges for both students and instructors in this hybrid model. One challenge for many instructors is allowing students be in control of their own learning. Students can advance at their own pace and the instructor role would be more that of support, clarification, and reinforcement via practice. In general, hybrid courses do not always require the same amount of time in the classroom (2/3) as online (1/3). That is, two thirds of the course time is delivered face-to-face while the remaining one third is delivered online. This could become a problem with regards to university administrations that might not financially compensate for the online section of the course and only quantify the in-class time, usually the majority of the course time. However, it could impact instructors’ workload (Godev, 2014). Godev conducted a study in which she compared a basic Spanish hybrid course with a traditional one. Twice the enrollment of students was in the hybrid rather than the traditional course. One of the main benefits of this hybrid model revealed that the amount of time spent by instructors in grading was the same as the traditional course that had half the number of students.